I see strange variation in the bandwidth limit when using latency setting. 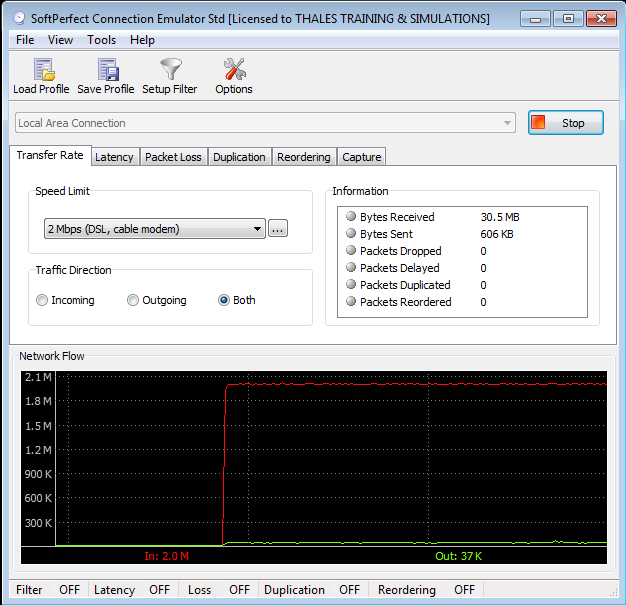 I am "streaming" to the PC where Connection Emulator is installed the maximum bandwidth available using PCoIP. First I use only bandwidth limiting to 2MBps. The limit works well, and I read the "IN:" parameter to 2Mbps. The graph looks flat. When I activate Latency to 65ms, I see "symmetric" spikes ranging from 1.7 to 2.3 totaling 2.0Mbps as mean, but exceeding the max setting of 2.0Mbps. I have the snapshot of both but cannot post them to the forum. PS: I put the buffer setting to 10 Millions. Are you using version 1.6? I have observed similar behaviour with older versions, but if you are seeing this with the latest version, I will check it again. I am using Version 1.6.0 64bits, on a Windows 7 64bit PC. This PC has only one network plug. Again, sorry for a delay with my response. We've been trying to reproduce this behavior and this didn't seem to happen, at least for a regular FTP download. This may be something specific to PCoIP. 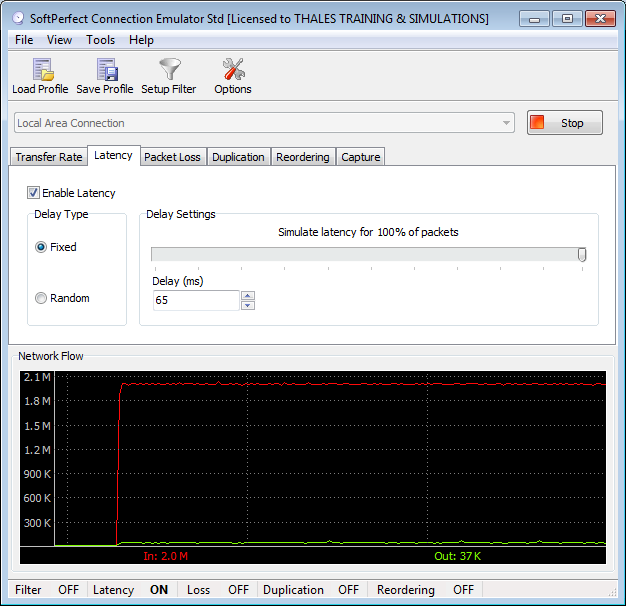 However, I have also done a couple of changes in the CE core related to the bandwidth cap and latency simulation. Please try the latest build and let me know if you are still experiencing issues.